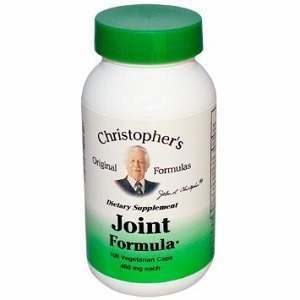 Dr. Christopher’s Herbs Joint Formula capsules according to the product source can be use to treat joint problems. It contains a combination of herbs that detoxify, act as a solvent for calcium deposits; herbs that relieve pain and are rich in organic calcium , kill fungus and infection and give joint pain relief. The product source does not provide product content or dosage amounts for any of these ingredients. The product source recommends 2 capsules 3 times a day or as directed by a doctor. The product website includes a polices section that describes the vendor’s return policy. Returns much be made within 21 days and there is a 25% restocking fee. The product source dose not contain a customer service contact phone number but does contain an email link in which to send questions. The product source contains only limited product information, leaving some questions unanswered although the source website does contain an email link to use to submit questions or to obtain additional information. Mark Stevens	reviewed Dr. Christopher's Herbs	on September 7th	 and gave it a rating of 2.